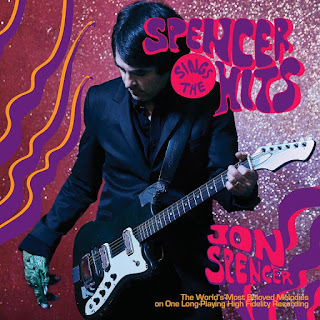 If It's Too Loud...: Jon Spencer - "I Got the Hits"
Based on The Jon Spencer Blues Explosion, Boss Hog, and Heavy Trash, you would assume you'd know exactly what solo Jon Spencer would sound like. He's been doing his own blend of hyped up punk blues or stylized rockabilly for decades now. On the first single from his solo album, there are hints of his classic sounds, but just a hint. The guitar solos are 100% his. That sound didn't go anywhere. But while his other bands always have a sense of being a bit tongue in cheek, "I Got the Hits" is straight forward rock. Of course, by rock I mean middle aged groovy punk, but it's much more palatable to mainstream audiences than anything he's released before, while still being good enough to satisfy his long time fans. You can watch the video for "I Got the Hits" below. Spencer Sings the Hits! will be released on November 2 on In the Red Records. You can pre-order your copy here.